Creek fish survive somehow in the creek. The water sinks into the copious amounts of gravel during dry times leaving isolated pools. Recent rains have started the creek flowing again. Last spring’s floods dug out one bank around one bridge pillar. It will take many very large rocks to fill the hole and encourage a flooded creek to go under the bridge instead of around it. In the meantime a pool surrounds the pillar. Creek fist are crowded into this pool. Some of the bleeding shiners are six inches long. All of the fish are hungry. 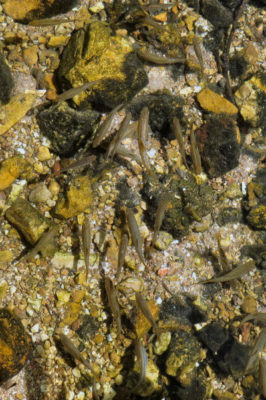 Minnows usually scavenge insects and insect larvae for food. Being cold blooded, they don’t need a lot of food. Lucky for them. Still, they do like to eat. Minnows abound in this creek pool that extends under the bridge. Most are bleeding shiners. They stay down in the water. Broad head minnows stay at the surface. All of the fish find ticks delicious. This is where the goats come into the picture. They crisscross the pastures and hills devouring whatever seems good that particular day. As they walk by, ticks leap on. In August these are mostly seed ticks (newly hatched) and the first instar ticks (seed ticks after one feeding). I check my goats for ticks every day. Looking for these small ticks is a waste of time until they have gorged themselves. That is in the mornings. 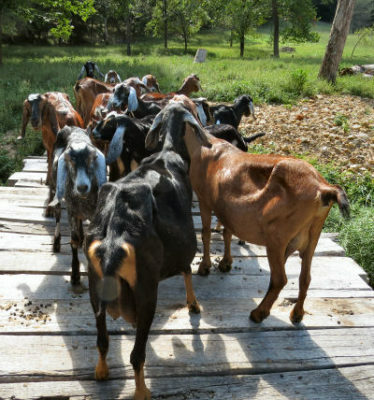 The goats gladly follow me out the pasture gate and onto the makeshift bridge. I stop. they mill around. The pastures are overgrown. Downed trees and left over branches made bush hogging a task for next year. The smaller herd seems to have trouble deciding on where to go. There is no one lead goat, one of those under rated, but very important herd members. This is great for the fish. The goats stand around while I pull ticks. The goats like the attention and vie for more. In spite of being checked for ticks during milking, the goats still have ticks on them. I pull these off and drop them into the pool. The creek fish go crazy as each tries to get as many of these delectable morsels as possible. The goats are not impressed. They get impatient and begin shoving. Each goat’s ears and nose have been gone over. So the goats now follow me down the overgrown tractor road toward the south pasture. Soon they pass me by. I turn back collecting a few fallen sycamore leaves to feed the bucks when I let them out for the day. The creek fish are still hungry, but will wait until the next morning for more ticks. This entry was posted in Ozark Hills and tagged bleeding shiners, goats, minnows, Ozarks creek, tick disposal on September 5, 2018 by [email protected].